This is my favorite time of year. I know it's hot and summer is almost over as is the current administrative year for Optimist Clubs, but what makes this time of year more special than others is the opportunity for everyone in your Optimist Club to work together. As you prepare for a big finish to 2009-2010 and ready for the transition of officers on October 1, there should be two teams working together to make one big, happy service club. Current officers are interested in adding members, recognizing supporters, celebrating success and most important of all ensuring continuity of the great work that has been accomplished. Incoming officers are busy making plans and getting ready to lead. Incoming and outgoing officers need to be communicating so that the transition is smooth, processes are improved and projects are carried forward that need to be carried forward. All clubs have a different way of doing this. Some allow the Club president to make all committee appointments. Others request volunteers and some even have lifetime appointments as committee chairs. All work, to some extent, but I have to tell you that I prefer a more purposeful planning process. I think that the Roseburg Optimist Club has a great approach. The Board of Directors looks at all of the programs for the year and identifies what they want to tackle in the coming year. Then they take their suggestions to a regular Club meeting and ask the members what events interest them. With support of the Board and members secure, then and only then, they circulate a list to have people sign up to be chairpersons. This process provides them a written annual calendar of events and a Work Plan to guide their efforts. Click here to take a look at the Roseburg Optimist Club 2010/2011 Coming Events and let us know if you like what you see. Thanks to Rheanna Mosier for sharing with us. Jim Jensen was recently honored at the Troutdale, Oregon Summerfest as the Citizen of the Year for their community. Of course we know Jim as a Past Governor who, along with his better half Jean, devotes a lot of time and energy to the Gresham Optimist Club and the PNW District. I thought it would be interesting to hear more about Jim and this special honor from an outside source and Jim obliged by sending me an article that appeared in a trade association magazine recognizing his accomplishments. As important as volunteer work is to a community’s well-being, it’s possible to devote so much to the public good that one’s own family takes a back seat. Jim Jensen, Troutdale "Citizen of the Year," says in his long history of community-minded endeavors, he’s tried to avoid that syndrome. “My wife and son might disagree, but I did my best to try and balance between work, family, and community service,” he says. Jensen, a Troutdale resident since 1979, was recognized as "Citizen of the Year" at the 38th annual Troutdale SummerFest. In 2002, Jim retired from Weyerhaeuser Corporation as credit manager in the Hardwood Lumber Division. Both before, but especially after leaving full-time work behind, Jensen delved into a range of volunteer organizations and projects such as: Troutdale Budget Committee, Optimist Club of Gresham, East County Economic Development Committee, Portland Jaycees, Gresham Community Emergency Response Team, and U.S. Forest Service volunteer car patrol. An Army veteran, Jensen is particularly fond of serving with the Patriot Guard Riders, a group of individuals that escorts remains of soldiers killed in action in Iraq and Afghanistan. Jim also treasures the time he volunteers at the Multnomah Falls information desk. With the help of his Honda Silver Wing scooter, Jensen does what he can to keep his inner youngster alive and kicking. Jim also was part of the Distressed Businesses Services team at NACM Oregon. He continues his Professional Membership through NACM Oregon and the CFDD Portland Chapter. He is actively involved with both organizations as an instructor and committee volunteer. When not working or volunteering, Jim and his wife, Jean, spend time with their son, Jamie, 36, daughter-in-law Maura, and grandchildren Logan, 6, and Amaya, 4. Recently, the couple, celebrated their 41st wedding anniversary with a trip to the Oregon coast. What a great tribute and honor, Jim. Congratulations. Are you registered for the District Convention? A special invitation for you from Optimist International President-Designate Danny Rodgers! Has your Optimist Club given $365 unrestricted to the Optimist International Foundations this year? Has your Optimist Club held an Adult Internet Safety Awareness Program? Has your Optimist Club given $2,000 or more to the CCC John Hopkins Initiative or the Canadian CCC Fund? 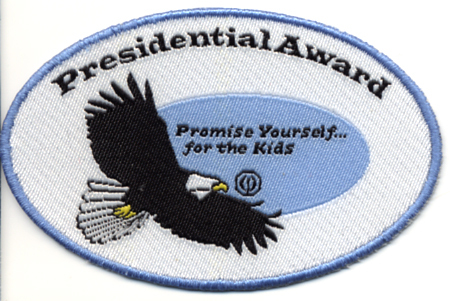 If you can say yes to two or more of these questions, then your club has earned the prestigious Presidential Award for 2009-2010. All you need to do is submit the verifying documents to the Optimist International Programs Department by mail, by fax at 314-371-6000 or via e-mail at programs@optimist.org. The good news is every club still has time to attain this honor. Talk to your Boards of Directors and go to it! The paperwork has been submitted to Optimist International and the officers have been elected for a brand new JOOI Club in the Pacific Northwest District - Optimist International. Sponsored by the Gresham Optimist Club, the JOOI Club is made up of students who participate in the PAL program. Shown here are the new JOOI members, some of the Gresham Optimist Club sponsors and Boyd Yaden (3rd from left) District JOOI Chair. Shown here are Gresham President Don Weston and newly elected JOOI officers. Welcome to the JOOI Club and congratulations! Please click on the link to check out the Amazing Race being organized by the Hillsboro Optimist Club and the Big Brothers and Sisters organization. Zone 4 is hopping with activities! The Beaverton Optimist Club has a great fondness for bicycles and President Bruce Buffington keeps them engaged with cycling activities in their community. The latest event was held on Sunday - Bike Beaverton. According to their official photographer Alan Zehntbauer, Zone 4 Lt. Governor, Bike Beaverton included your choice of a family friendly ride or a fitness ride with ice cream for everyone at the end. In the pictures, I noticed an obstacle course for bicycle safety too. Thanks so much Alan for sharing your pictures with us! Optimist Club members are happy because we do what we love and love what we do. If you support others, they will support you. Finding meaning and purpose in life is the key to happiness. When we come together as Optimist Clubs we soon discover that there are a great number of people doing really good things in our communities. The unified mission that your Optimist Club shares with approximately 3,000 other Optimist Clubs around the world is energizing. Together we can do so much more to share a positive way of life, to help our kids and communities and to share our happiness and our passion. Please share your passion for Optimist Clubs every day by talking about what you do, telling positive upbeat stories and asking others to share some happiness with you by joining your Optimist Club. Your passion and enthusiasm are needed and appreciated.